Are you looking to stay fit, active, and healthy as you get older? Follow these five fitness rules to maintain your mobility and strength at every age. Whether the goal is to keep up with younger family members, travel the world, or participate in your favorite sports and hobbies, there are many motivations for maintaining a fit body beyond the age of 40. Regular fitness activity like weight training, cardio, and functional bodyweight training keep people of all ages young and capable, but this is especially true if you’re over 40. Listen to what those aches and pains may be trying to tell you — if your lower back hurts, give it the love it needs with a little extra stretching! Make smart decisions that help you stay fit rather than risk injury. Recovery after workouts slows down. You may need a day or two of rest after an intense workout. While you may have been able to manage daily, vigorous workouts in your 20s and 30s, recovery becomes more important after 40. Goals may change. You may have been motivated to work out for aesthetic reasons in years past. But, as we age, our goals shift towards feeling better so we can continue to engage in those physical activities we most enjoy. Functional exercises that keep you strong may do more good than isolation exercises intended to sculpt or chisel you into shape. Fear may set in. Many older people report being afraid to try new things or take risks in their workouts simply because of their age. While age can be an increased risk factor, it certainly doesn’t have to be. Be confident, and you’ll overcome age-related fears that might hold you back from reaching your fitness potential. What matters most isn’t your biological age, but your current abilities. These rules will guide you toward your best fitness level, no matter your starting point. There is no age in your life where you should stop working out. It doesn’t matter how long it’s been or if you’ve ever worked out in your life. If you’re over 40 and have never completed a single exercise routine, now is a great time to start! Don’t jump into a fitness class full of 18-year-olds and expect yourself to keep up with their pace and intensity, though. Workouts can be modified for all starting points. The best way to work out in your 40s is to follow a functional fitness training plan designed with your goals in mind – modify as necessary. Take as much recovery time as you need between sets and take extra precautions against joint damage and jarring movements. You may need to warm up a little more than you used to, or work a little harder to keep your form more precise. 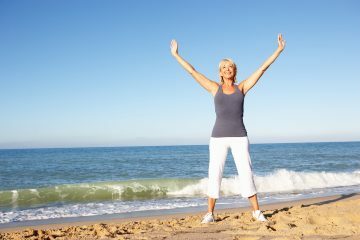 Still, you can, and should, do standard exercises that benefit everyone at every age, like squats, pushups, and lunges. Age and fitness are two different things. You can be fit or unfit no matter your age. Many 40-year-olds are in far better shape than people decades younger. Try to let go of the “age-equals-fitness-level” idea; focus on how strong and fit you are and how strong and fit you want to get. This limiting belief system may be holding you back without you even realizing it. Don’t use age as an excuse. Listen to the things you say when you talk about your fitness and physical abilities. Don’t dismiss activities with “I could do that when I was younger” or “I’m too old for that now” statements. One of the biggest misconceptions about fitness is that it’s only for young people, and you shouldn’t even try past a certain age. Letting go of excuses will open up a world of possibilities and potential for you. When we’re young, we can jump into consecutive workouts with little to no recovery time. The illusion of invincibility fades as we age and recovery becomes more important than ever. You may notice that your digestion and metabolism have slowed as you age. This slowdown affects your muscular system in much the same way. Instead of moving from one exercise to the next with no rest, you may find you perform better if you allow yourself a full minute of rest in between. You also might need to take two days off between intense workouts. Listen to your body and pay attention to your performance and results. Don’t compare yourself to a younger generation. Aging comes with its trials and triumphs, but your fitness improves with a positive mindset. Most people who work out consistently are much stronger and even leaner in their 40s than they were in their 20s. You have more experience on your side, which can be a huge benefit to working out more efficiently and effectively. You are wiser, smarter, and better in so many ways, and the best part is that you get to influence younger people with your savvy. Be a good role model for those younger than you. Now that you know the rules, let’s go over some of the do’s and don’ts for fitness over 40. Spend a little more time warming up before every workout. Do some dynamic stretching and perform a few light sets of every exercise before you challenge yourself. Allow extra recovery periods during your workout and between workout days. It’s okay to reduce the number of workouts per week. Listen to your body and your results. Let go of fears about starting new things at your age. Instead, focus on your abilities and goals. Work out recklessly and risk injuring yourself. Be smart, use good form, and take care. Try to keep up with people half your age. It’s not a competition; it’s about you feeling your best and reaching your goals. Compare yourself to your younger self or anyone else. The comparison game helps no one. Keep your focus on you and what you wish to achieve. Are you seriously calling a 40 year old “Older”? Good grief Im 66 and I still workout, I know folks in their 70’s 8-‘s AND 90’s who go to the gym regularly!